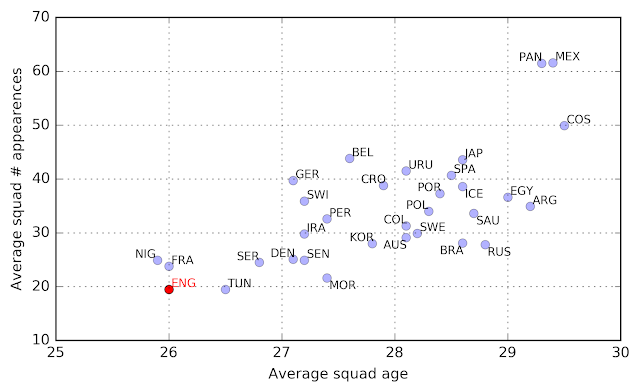 Figure 1: Average squad age versus average number of senior international appearences (on the date the final squads were announced) for each of the 32 World Cup squads. Costa Rica have the oldest squad in the tournament, with an average age of 29.5 and ten players in their thirties. The most experienced squads, however, are from Panama and Mexico: their players have made an average of 61 international appearances. England have the second-youngest (joint with France) and the least experienced squad in the tournament. 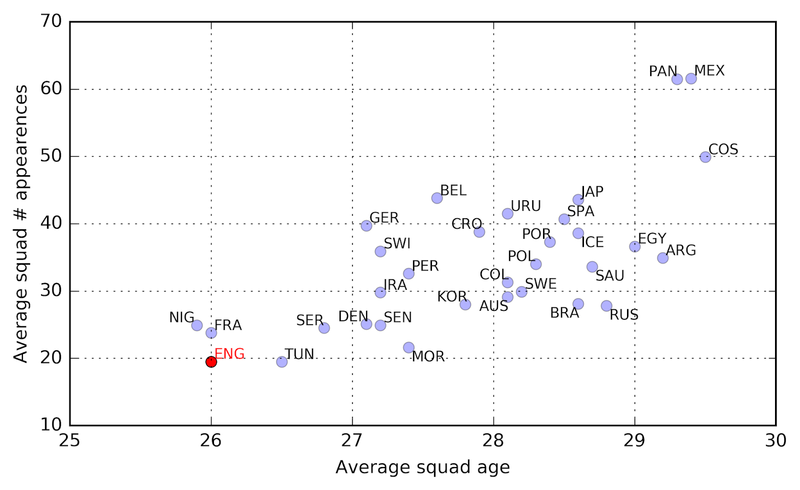 The average age of the England squad is 26 -- only Nigeria's is younger -- and they have played an average of 19 senior international matches. 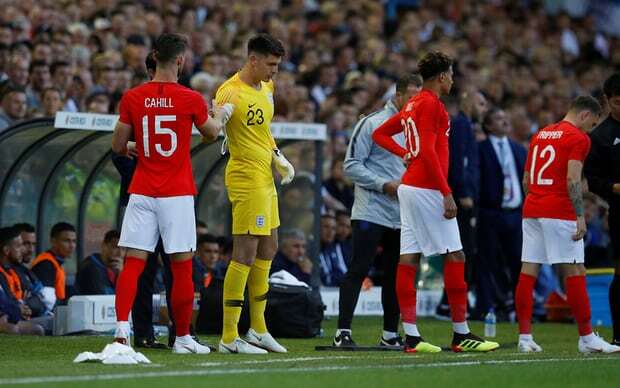 Only one player (Gary Cahill) has played over 40 matches for England; 17 are playing in their first world cup and 8 are playing in their first major international tournament. France have also selected a relatively young squad, although it does contain five players with at least 50 international caps. Does lack of experience actually matter when it comes to performance? Looking back the last six World Cup tournaments, only two of the twelve finalists had an average age below 26.5: the 2014 champions, Germany (26.2) and the 2010 Champions, Spain (26.4). However, both squads also contained experience, averaging nearly 40 international appearances per player -- twice the current England squad. Of course, players need to be selected to gain experience, and besides, after the poor performances in 2014 and Euro 2016, it makes sense to look to the future. 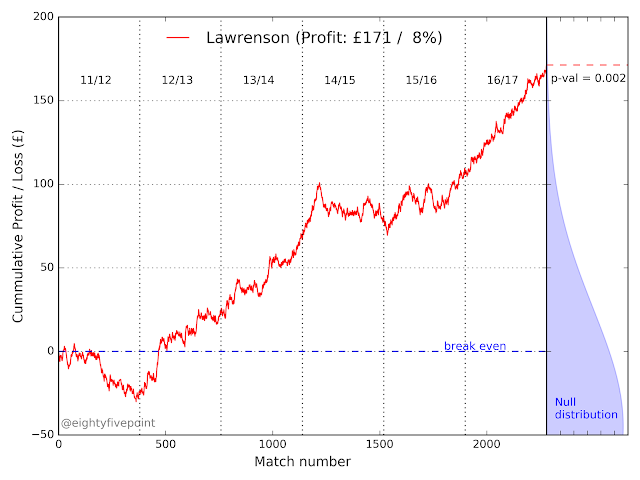 So perhaps this tournament is part of the learning curve for many of the current crop of players. 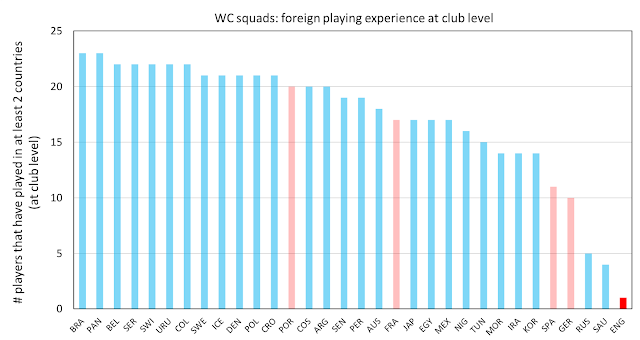 Another interesting feature of England's squad is their near total lack of foreign playing experience at club level. The chart below shows the number of players in each squad that have played for clubs in more than one country during their career. The major European leagues -- that is, those that tend to attract (and retain) the best players -- are highlighted in red. Figure 2: The number of players in each World Cup squad to have played for clubs in more than one country. With so many of the world's best players on show, you'd expect a lot of them to have played in Europe at some point in their career. For that reason, it's not surprising that 549 of the 736 players -- nearly 75% -- have played for clubs in at least two different countries. This also applies to the majority of the French and Portuguese squads, and nearly half the German and Spanish squads. Only three squads have fewer than 10 players to have played in more than one country: Russia (5), Saudi Arabia (4) and England (just 1). Every player in the England squad is currently based at an English club, and only one player, Eric Dier, has ever played for a non-British club (Dier grew up in Portugal and played for Sporting Lisbon for several years before joining Spurs). This is a fairly standard feature of England's squads over the last few tournaments; in 2014 no players had experience playing abroad, and in 2010 there was only one: Peter Crouch (early in his career he played in the Swedish fourth tier). Does this matter? Fewer than half the players in the EPL are either British or Irish, so English players clearly have plenty of experience playing with foreigners. However, other aspects of playing abroad may provide important benefits, such as the experience of playing in different atmospheres, climates and cultures. These might be somewhat intangible factors, but perhaps they are part of the explanation of the phenomenon known as home advantage. Maybe it is no surprise that the last time England made any notable progress in a major international tournament was at Euro 96, in England. We can speculate about whether foreign playing experience affects performance in major international tournaments, but I doubt we can quantify it. However, it's encouraging that a number of young English players are now looking to gain experience abroad, and I hope others do likewise. Thanks to Simon Gleave for pointing out an error in an earlier version. I'm not counting playing in Scotland as 'foreign experience'.